Wieland, Carsten: Syria - Ballots or Bullets? In the Oregonian, 18 months ago, I wrote that I wanted to pay more taxes -- and invited others of means to join me. Since then, income inequality has only gotten worse. Last month's US Census data unmasks the widest income gap ever between the richest and poorest Americans. This confirms recent IRS data, which show the greatest income disparity since the Great Depression. Why, then, did Congress recess without eliminating the Bush tax cuts for the top 3 percent of U.S. income earners, families earning more than $250,000 a year? Scrapping the Bush tax cuts for top earners would put another $700 billion into an already depleted U.S. Treasury in the next decade or could be used to help those in need. The trickle-down apologists claim that those of us in the top 3 percent will cut jobs or be unable to grow our businesses unless we keep paying a 35 percent marginal tax, instead of a 39.6 percent marginal tax. By way of example, if your family makes $750,000, you will pay about $20,000 more in federal taxes. Can a family making $750,000 really not afford to pay an additional $20,000 in taxes? Is this really considered punishing the rich? I can't understand how the middle class and many of their elected representatives have bought into the propaganda that taxes can't be raised on the rich. The idea that a 4.6 percent tax increase on the wealthiest Americans will somehow eliminate jobs is unsupported by any credible evidence. Such a minor tax increase on the top 3 percent simply returns us to the 39.6 percent tax rate of the generally prosperous 1990s. For our country to truly prosper, all Americans have to do better economically, not just the wealthiest few. Even a capitalistic country isn't judged solely by its total GDP growth. Our country should also be judged by how equitably we distribute the benefits of economic growth among our citizens. We haven't done well in this critical area over the last 30 years. According to the Institute for Policy Studies, in 1980 the average CEO to average worker pay ratio was about 30-to-1. As of 2009, the average CEO to average worker pay ratio had grown to 263-to-1. This astonishing change is nothing short of revolutionary. While incomes at the top have soared, Congress has gone in the opposite direction by cutting tax rates on the top earners. The highest tax rate was 70 percent in 1980, as compared with 35 percent today. The recent census and IRS data reveal that our country's movement toward a wealth-concentrated feudal society is just being stoked by our existing tax structure. We can't keep in place a tax system that leaves so many of our fellow citizens economically behind. Compassion must play a more central role in this tax debate. We need our elected leaders to say that we in the top 3 percent of earners can easily make a modest sacrifice of 4.6 percent of our annual incomes. That's little compared with the sacrifices already made by tens of millions of people who have endured real hardship in our recent hard economic times. Raising taxes on us top earners would be a perfect place to start rebalancing our country's wealth disparity. I believe in my heart that more than 3 percent of us have to succeed economically for our country to be successful. We at the top have received inordinate spoils from this great country, and we need to contribute more in taxes to ease the burden on those less fortunate. 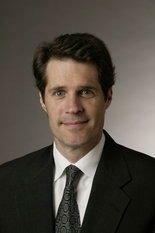 - Jim McDermott chairs the litigation department at a downtown Portland law firm.